A Follow Spot: Talking Tony! Nominations for the American Theatre Wing's Antoinette Perry Awards (AKA the Tony Awards) were announced yesterday, with some surprising choices and yes, a few snubs, in the mix. For local theater fans, three shows with connections to local colleges were nominated. Musicals "Newsies," which features IWU grad Evan Kasprzak, and "The Gershwins' Porgy and Bess," with another IWU alum, Bryonha Parham, in the cast, both scored multiple nods, as did "Clybourne Park," the Chicago-based play whose cast includes Crystal A. Dickinson, who earned her MFA at the University of Illinois in Urbana. 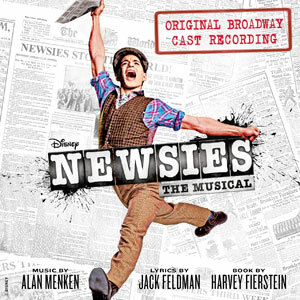 "Newsies the Musical" received a total of eight nominations, including nods for Best Musical as well as its score, book, choreography, orchestrations and scenic design. 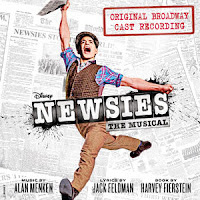 Director Jeff Calhoun also got a nod, as did Jeremy Jordan, who plays the leader of the newsboy revolt, who was nominated for Best Performance in a Leading Role for an Actor in a Musical. This "Porgy and Bess" was controversial when it started, with protests from Stephen Sondheim, among others, over the changes to the original book to try to make the show more friendly to contemporary audiences. Casting the much-beloved Audra McDonald as Bess probably took out some of the sting, and the Theatre Wing has rewarded the show with ten total nominations. McDonald got a nod, along with Norm Lewis, her Porgy, David Alan Grier and Phillip Boykin, nominated in the Featured category for their roles as Sporting Life and Crown. Diane Paulus, the one who spearheaded the changes to the book, is nominated as Best Director, with the costumes, lights, sound and orchestrations. "The Gershwins' Porgy and Bess" is also nominated as Best Revival of a Musical; it will vie against Sondheim's "Follies" revival plus two ALW shows -- "Jesus Christ Superstar" and "Evita" -- in that category. 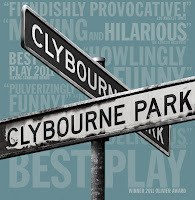 Bruce Norris's "Clybourne Park" has also had a rocky road to the Great White Way, although not because of its content. Instead, the play and its cast faced possible doom when producer Scott Rudin abruptly pulled the rug out from under it because of a squabble with playwright Norris over a different project*. But "Clybourne Park" and its Pulitzer Prize managed to survive without Rudin, opening in previews at the Walter Kerr Theatre March 26, with official opening night on April 19. Now that it's up and running, "Clybourne Park" has snagged four Tony nominations, including Best Play, Best Performance by an Actor in a Featured Role in a Play for Jeremy Shamos, Best Direction of a Play for Pam McKinnon and Best Scenic Design of a Play for Daniel Ostling. Overall, the musical "Once," an adaptation of the indie movie from 2006 about an Irish street musician and a woman he meets and creates music with over the course of one week, led nominations with 11, including nods for Best Musical, leading actors Steve Kazee and Cristin Milioti, supporting player Elizabeth A. Davis and director John Tiffany, plus the book, choreography, lighting design, sound design, orchestrations and scenic design (for the always amazing Bob Crowley). After that, the above-mentioned "Porgy and Bess" and "Nice Work If You Can Get It," a new Gershwin musical weaving together songs from old Gershwin musicals, much like "Crazy For You" and "My One and Only" before it, each received ten nominations, with the Peter Pan prequel "Peter and the Starcatcher" right behind with nine. "Peter and the Starcatcher" is a bit of an oddity, a straight play (nominated for Best Play) with enough music to also earn a nomination in the Best Original Score category. Christian Borle, who stars in "Smash" on NBC, is nominated for his featured role in "Starcatcher," and one of my favorite actors, Roger Rees, is nominated as one of two directors for the piece. Three of the four major players in the recent "Follies" revival -- Jan Maxwell, Danny Burstein and Ron Raines -- were nominated, leaving out only Bernadette Peters. No worries -- Ms. Peters is getting this year's Isabelle Stevenson Award for humanitarian and charitable contributions. And veteran Jayne Houdyshell, who belted out "Broadway Baby" in the revival, is nominated in the Featured Actress category. Tracie Bennett in "End of the Rainbow"
Stockard Channing in "Other Desert Cities"
Linda Lavin in "The Lyons"
James Corden in "One Man, Two Guvnors"
Philip Seymour Hoffman in "Death of a Salesman"
James Earl Jones in "The Best Man"
Frank Langella in "Man and Boy"
John Lithgow in "The Columnist"
Audra McDonald in "Porgy and Bess"
Kelli O’Hara in "Nice Work If You Can Get It"
Laura Osnes in "Bonnie & Clyde"
Norm Lewis in "Porgy and Bess"
Linda Emond in "Death of a Salesman"
Spencer Kayden in "Don’t Dress for Dinner"
Cella Keenan-Bolger in "Peter and the Starcatcher"
Condola Rashad in "Stick Fly"
Michael Cumpsty in "End of the Rainbow"
Tom Edden in "One Man, Two Guvnors"
Andrew Garfield in "Death of a Salesman"
Jeremy Shamos in "Clybourne Park"
Elizabeth A. Davis in "Once"
Judy Kaye in "Nice Work If You Can Get It"
Jesse Mueller in "On a Clear Day You Can See Forever"
Da’Vine Joy Randolph in "Ghost"
Phillip Boykin in "Porgy and Bess"
David Allen Grier in "Porgy and Bess"
Michael McGrath in "Nice Work If You Can Get It"
Josh Young in "Jesus Christ Superstar"
Nicholas Hytner for "One Man, Two Guvnors"
Pam MacKinnon for "Clybourne Park"
Mike Nichols for "Death of a Salesman"
Roger Rees and Alex Timbers for "Peter and the Starcatcher"
Kathleen Marshall for "Nice Work If You Can Get It"
Diane Paulus for "Porgy and Bess"
The so-called "Regional Tony," awarded annually to a non-profit, professional theater outside New York City, will go to Washington DC's Shakespeare Theatre Company. Every year, the American Theatre Critics Association, of which I am a member, recommends a recipient, and the award is then presented by the Broadway League and the American Theatre Wing as part of the Tony ceremonies. And speaking of ceremonies... This year's Tony Awards will be broadcast on CBS on Sunday, June 10, with Neil Patrick Harris once again hosting. *That project was a TV version of Jonathan Frantzen's "The Corrections," which went ahead with a pilot, but was recently passed over by HBO. So there you have it. No love for Scott Rudin. 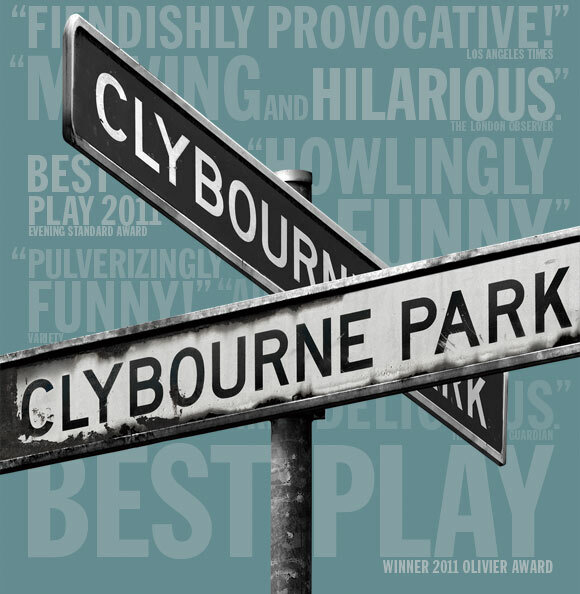 Although there has been speculation that "Clybourne Park" would've received more than just the four nominations if not for the Rudin kerfuffle, given its Pulitzer, Olivier and general critical acclaim. The nominations make unusually interesting reading this year. Two Best Score nominations for plays rather than musicals (bypassing some seemingly viable candidates like Bonnie & Clyde). A nice mention for Christian Borle in a year when my respect for him has grown a lot. AND in Follies: The 3 stars who are not Bernadette Peters seems about right to me, on the basis of my experience of the production. (The question is, can Jan Maxwell overcome the force that is Audra McDonald?) And especially gratifying discrimination in the Featured Actress there: No to Elaine Paige, Yes to Jayne Houdyshell. Exactly!